If you are serious about taking out deep creases with minimal effort in as little time as possible, you need to stop wasting time with standard steam irons. 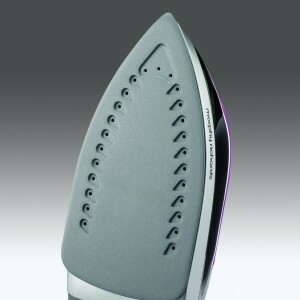 Standard steam irons generate steam in one part of the iron itself. Pushed through the iron’s steam channels, these devices inject steam into a surface and promptly passes heat on that surface through the soleplate of the iron. While this system works well enough for most light to medium ironing chores, if you are dealing with heavy cloth or thoroughly wrinkled surfaces, this is not good enough. You have to level up. 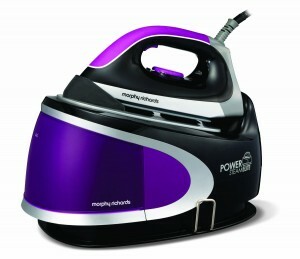 This is where the Morphy Richards Power Steam Elite 42223 comes in. Just judging by the design of the 42223, you can immediately tell that this unit was designed for heavier duty steam iron loads. This is no light weight unit and the results it produces are definitely serious. However, it is not for everyone. Keep the following discussion in mind when considering adding this unit to your home’s ironing appliance set. When it comes to creating hot steam quickly and in the right volume, the 42223 is all about business. This iron has a steam unit that is dedicated to producing steam quickly and at high pressure levels. Once your iron has absorbed this steam, it unloads at 4.5 bar pressure. Mind you, it’s not unloading middling amounts of pressurized steam. We’re talking an impressive 180 grams. This tremendous pairing ensures that even the toughest and most persistent creases will go away with your first pass. At worst, it may take you a couple or a few passes to make such creases go away. Compare this with having to wear out your arm taking a ridiculous number of passes with lighter duty steam irons. There’s no comparison. Considering the fact that this unit produces a lot of steam, it is easy to forgive its 2400 watts. 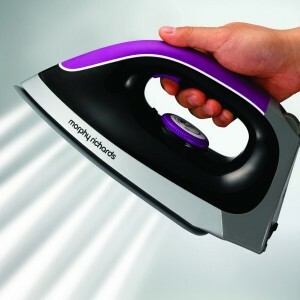 If the Morphy Richards Power Steam Elite 42223 didn’t produce such a heavy steam output and unleash so much pressure, its 2400 watts power might be a liability. However, given its steam power, its otherwise medium weight wattage is easy to forgive. Still, if you are looking at picking up this Morphy Richards model for heavy duty volume ‘difficult fabric’ ironing, you might want to reconsider. It might not have the power you need to take care of your loads. Given that this isn’t exactly a light unit, it may prove to be too under powered as you take extra passes to smooth out particularly tough surfaces. Thanks to the nonstick and smooth soleplate of this unit, you can say good-bye to the unsightly ironing ‘lines’ of older iron models that don’t use ceramic soleplates. Its ceramic bottom doesn’t leave slight lines. It is also easier to push through materials to produce smooth clean flat surfaces. Since you don’t feel any resistance as you iron a surface, you have more elbow room and this range of motion enables you to conserve energy. You don’t feel weighed down when using this unit. While it is quite heavy, it still produces a lighter ironing experience compared to a heavier steam iron which only allows for a limited range of motion. You can get a lot more done quickly. It feels your quickly gliding over otherwise tough fabric surfaces. Paired with this unit’s superior steam generating and steam injection technology, its lightweight and range of motion allows for smoother surfaces that look like they were professionally ironed. As a home unit, this unit would be a decent choice. Again, keep in mind its power limitation in light of the fabrics you will be working with. In most situations, this unit should be more than adequate when taking out particularly tough creases. However, as a travel steam iron, you might want to think twice about using this model. It simply is too heavy. Sure, it can knock out heavy creases but it sure might be a bit too bulky and inconvenient to use out of travel luggage. If you are a busy travel out on business, it might be a better idea to pack a lighter steam iron. In terms of ease of use, this unit’s controls is second to none. You don’t have to be a master of cryptography or Egyptian hieroglyphics to tell which feature is which and to set the unit to produce the amount of steam you’re looking for. Fire and burned clothing are the two most common risks you run with any kind of iron-whether it be a simple or complicated feature-loaded steam iron. Users of the Morphy Richards Power Steam Elite 42223 get a much welcome dose of peace of mind with this model’s auto-shutdown feature. If, for some reason, you have to run out of a room in the middle of ironing with this model, this unit’s auto-shutdown feature will ensure that you don’t burn the piece of clothing or material you’re ironing. Of course, no burned materials mean less risks of fire. This unit’s auto-shutdown feature can save you quite a bit of money in terms of wasted clothing and materials. Moreover, in terms of peace of mind, the value you get is simply priceless. 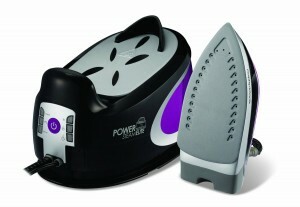 Unlike most other steam irons, this unit has a two year warranty. Not only does its auto-shutdown feature give you peace of mind as far as burned materials are concerned, its generous two-year warranty protects you from early burnout. Considering the relatively heavier duty steaming you can perform with this unit and wear and tear involved, a two year warranty is definitely a very welcome feature indeed. If you work on heavy clothing or other heavy materials regularly or the kinds of creases you normally work with tend to be very tough, you might want to consider the Power Steam Elite 42223. While it isn’t perfect and might be inadequate for consumers who iron very creased heavy fabrics most of the time, for average consumers with a decent load of easy creasing materials, this Morphy Richards might just be the best steam iron option for their situation.